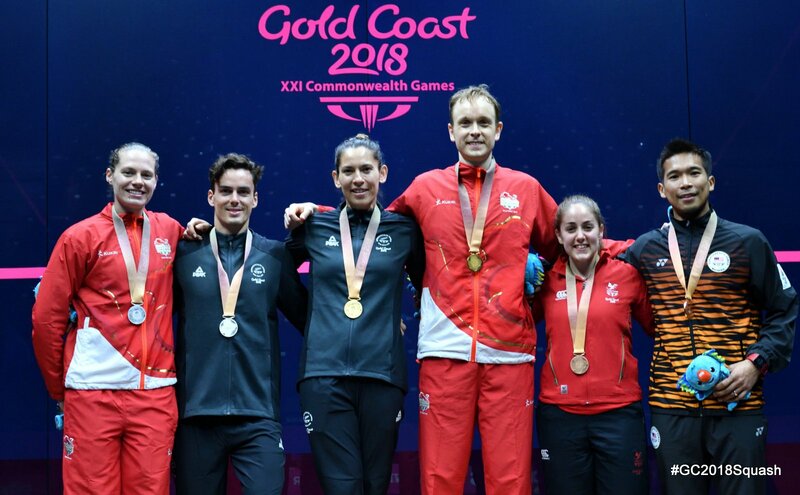 England and New Zealand shared the glory on Singles finals day at the 2018 Commonwealth Games Squash when Kiwi Joelle King struck gold in the women’s event and it was third time lucky for two times runner-up James Willstrop in the men’s climax at Oxenford Studios in Gold Coast, Australia. King, a gold medallist in the Women’s Doubles in 2010, became New Zealand’s first ever Singles gold medallist when she beat England’s Sarah-Jane Perry. It was always clear that the match would be a close-fought affair – and so it was. Fourth seed Perry had two games balls in the first, but it was King who closed out her fourth game ball to win the opener 16-14. The New Zealander opened up a two-game lead – but Perry drew level to force a decider. From eight-all in the fifth, King moved ahead to clinch the match 16-14, 11-8, 6-11, 11-13, 11-8 after 78 minutes take gold. On winning her country’s first gold, King acknowledged: “Yes, it feels pretty good. We’ve had some great names that have come through the squash community from New Zealand and no-one’s managed to do it yet – so it’s a privilege, to be honest, to be the first one to do it and I’m just looking forward to celebrating with my team-mates. Whilst seeded two, King became the event’s highest-ranked player after moving up to four in the world on the eve of the start of the event. “To be honest I didn’t pay much attention to that,” said the 29-year-old. “Obviously I was excited and happy that my ranking had moved but I didn’t really look any further than the fact there were probably about 12 players in this draw that could realistically win the tournament – so I just took it match by match. 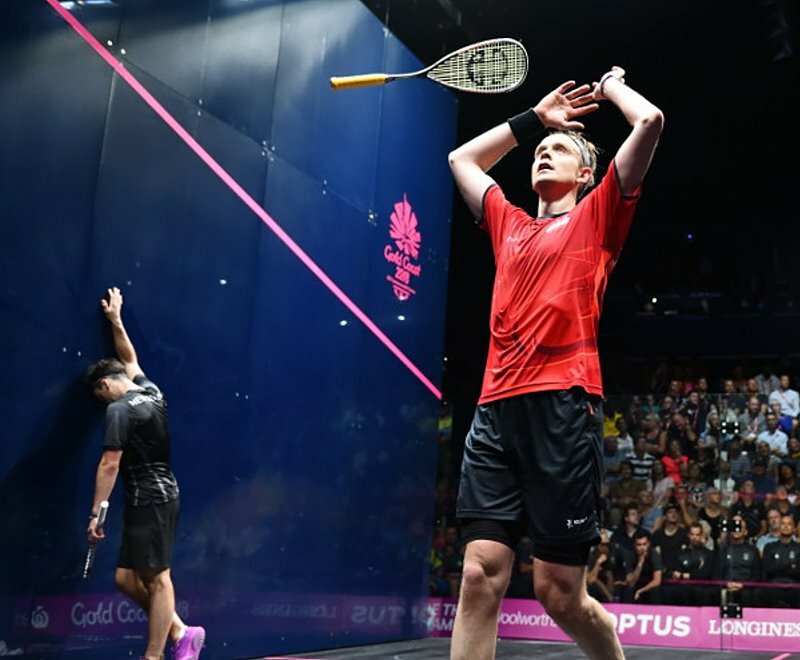 England gained revenge in the two nations’ battle in the men’s final when Willstrop, the fourth seed, prevailed in straight games over in-form Kiwi Paul Coll, the number two seed ranked nine in the world. Both players had had arduous routes to the final – Willstrop denying home interest in the later stages by beating top Australian Cameron Pilley in 95-minute quarter-final battle and Coll surviving a 106-minute semi-final clash with Welsh outsider Joel Makin less than 24 hours before the final. Willstrop was in imperious form, claiming his first 3/0 win since the opening round by beating Coll 11-9, 11-4, 11-6 in 47 minutes. “It just clicked for me today,” admitted the 34-year-old from Harrogate. “It’s stuff you dream of. It’s one of the most brilliant performances I’ve had in my career. It just worked and it clicked – that’s happened today. I don’t know why, maybe the hours of solo practice I’ve put in on my own on court, in Harrogate and Ponte, all my life. “It’s an incredible thing – and to make it happen on a big day like today – it’s one of the best performances. Whatever happened today, it’s an achievement. “I love playing the game – and four years ago there were some doubts about that – and to think I’m now here with a gold medal in the singles … I can’t really process it to be honest. The Bronze medal matches were just as dramatic and emotionally-charged. The women’s clash saw Malaysian superstar Nicol David, the long-time world number one and gold medallist in 2010 and 2014, take on fast-rising Welsh star Tesni Evans. Undaunted by a 4/0 career head-to-head record in the 34-year-old Malaysian’s favour, sixth seed Evans delivered a scintillating performance to see off David, the No.3 seed, 11-7, 3-11, 12-10, 11-7. “It’s truly amazing – unbelievable really – I’m absolutely over the moon,” exclaimed the Welsh wizard. “I’ve had a great week and to beat someone like Nicol for the bronze medal is just out of this world. If you’d asked me 10 years ago, 5 years ago, I never would have thought I would beat her. She’s an absolute legend. That’s the first time I’ve ever beaten her so that’s extra special as well. “I’ve gone from the bottom of the scale to the top of the scale, literally. I was really down yesterday after my semi-final match – but thank you to Dave (Evans) and my team, they really picked me up last night. They made me just realise where I am and that I still had a medal to fight for. The first Games medal for Wales for 20 years was greeted with delight by national coach David Evans. 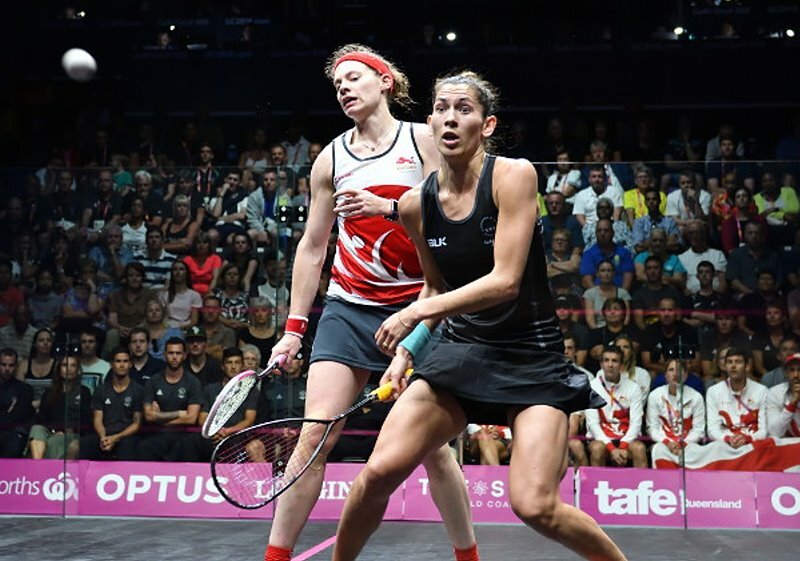 “It’s an amazing result for Tesni and Welsh squash as a whole, getting a medal in the Commonwealth Games,” said the former British Open champion. “The last one was in 1998 with Alex Gough, so to get a medal is unbelievable. “I gave what I could today – someone has to come out a winner. I just couldn’t quite put some things together. It‘s tough out there but I’m really proud of the years of representing Malaysia. Malaysia took bronze in the men’s play-off where 12th seed Nafiizwan Adnan beat Welshman Joel Makin, the No.11 seed, 11-7, 6-11, 9-11, 11-4, 11-5 in 81 minutes. “It was the biggest ever match I’ve ever played – it was enormous. I can’t believe it, I was so nervous just now.